The world can be a stressful place at times, and it helps to have a few spaces–safe spaces where you can be yourself and let your guard down–to relax and replenish your energy. It’s important to have specific times, places, and groups of people who foster a sense of relaxation and emotional safety for you, as it’s more difficult to manage the stress of criticism, negativity, and high demands when you’re already compromised by stress. This can help you to build resilience and relieve stress when you need to. Here’s how to create a few such “safe spaces” for yourself in different areas of your life. Before going into the more creative and less obvious ways to create a safe space where you can talk about what’s stressing you and feel free from additional stress and judgement, I’d like to mention an obvious solution: therapy and traditional support groups. If you feel that the stress you are experiencing is overwhelming, or if you’re dealing with serious trauma or situations that the average person may not understand, therapists and support groups can be wonderfully effective. If you’re dealing with less-serious situations, you may want to try the following suggestions first, with the idea of a support group or professional helper as a back-up if you need it. Finding groups of completely like-minded people isn’t always easy, but you can bet there’s a group of people who share certain interests you have, and you can usually start there. 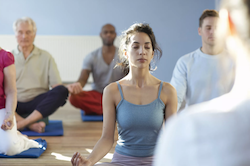 I’ve found that exercise groups, particularly classes where the focus is a less competitive activity like yoga, pilates, or even meditation, can be great places to find others who want peaceful self-improvement. Many of these classes are like small communities in themselves and they can be quite supportive, not just for goal-achievement and motivation, but emotionally as well. Try some and see which ones feel like “home” to you. Creating a physical space where you can really relax is vital, particularly if you’re an introvert. Start with your own home, and make it a place that you are happy to come home to. Put up pictures that remind you of your favorite people, use aromatherapy and music, and be sure to try relaxing activities. Here are some more ideas you can put into use to make your home your safe space. You’ll be glad you did. Working on yourself can help you feel more comfortable in your own skin, and help you feel more emotionally safe wherever you go. Learn to say no without stress, set healthy boundaries, remember (and revel in) your strengths and successes, and more. These tips can help you to build self-esteem and resilience toward stress. Put them to use and you’ll find yourself feeling more confident and in control when you’re facing people and situations that tend to tear you down. This entry was posted in Anxiety, Habits, Self-care. Bookmark the permalink.